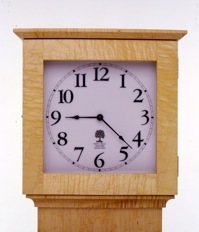 Each clock is made by hand, from rough boards to the finished product, by me alone. Using solid timbers, usually American cherry, walnut or curly maple, selected by hand for each clock, I employ traditional methods of joinery - such as pinned mortise and tenon joints of the upper door. 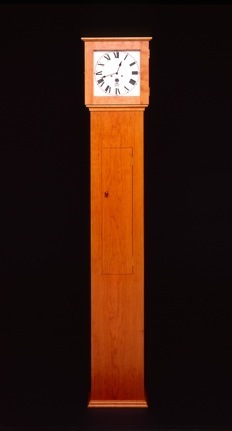 The front of each clock is made of one solid board, requiring exceptionally wide timbers which are becoming more rare and difficult to acquire. The knob of the lower door is turned by hand on a lathe; all hardware is solid brass; each dial is hand screened with a hand painted logo of the maker.